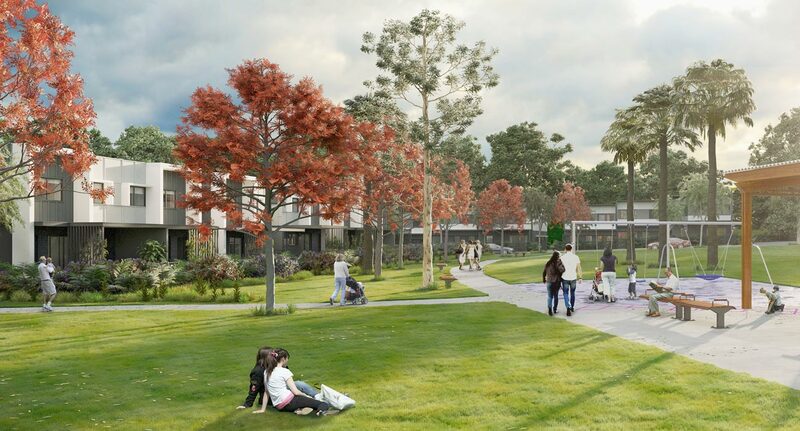 A collection of 24 townhouses with direct park access, Park Terraces is an exciting new addition to Sunnybank and Coopers Plains. Having a well-maintained park as your backyard elevates Brisbane’s sub-tropical lifestyle and it’s this unique setting that inspired the architecture of these residences. There is a growing body of evidence that draws connections between the outdoors and wellbeing, mood and decreased stress levels. That’s why this release of Park Terraces is such an important piece of the Cornerstone Living neighbourhood. With direct park access, residents have the opportunity to enjoy the tranquility that comes from living close to a leafy green setting. Given that Brisbane has a warm climate year-round, all our apartments and townhouses are designed to create a connection between indoor and outdoor spaces. With this new release, building upon the indoor-outdoor connection and parkside location was the foundation of the townhouses’ architectural design. With a select number of townhouses also offering direct park views from living areas, residents will be able to enjoy the tranquility of the parkside location from the comfort of their living spaces. Our vision is for the park to act like a backyard where residents can regularly spend time reading, exercising, having picnics or walking the dog – all without having to maintain a real backyard. Townhouses feature open-plan living and direct park access. The design also incorporates the key architectural features of all our properties, including controlled solar access, rain shading, insect screening, natural cross-ventilation and fully insulated walls and roofs. To see the full list of inclusions (which include air-conditioning, walk-in wardrobes and access to the NBN) and a look inside the townhouses, see the Park Terraces portal.